Protecting Indigenous Peoples' and local communities' rights to their lands and forests has the potential to make a significant contribution to that solution. A new report from the Rights and Resources Initiative, Woods Hole Research Center, WRI and Environmental Defense Fund shows that Indigenous Peoples and local communities worldwide manage massive amounts of carbon in the trees and soil of their forests—at least 293,061 million metric tons. That's 17 percent of the total carbon stored in the world's forestlands. If this carbon was released at once, it would equal 33 times the total global energy emissions of 2017. This new report assesses 64 countries for which data were available (representing 69 percent of forest carbon globally). This analysis has a wide geographical footprint that includes community-managed lands across tropical, subtropical, temperate and boreal zones. In addition to aboveground forest carbon, it also includes carbon stored below ground both inside and outside forest areas. With this wider scope, we now know that community-managed forest carbon is more than five times as plentiful as previous analyses had quantified. While attention is often focused on carbon locked up in trees, in fact, most of this carbon lies in the soil. Belowground carbon includes an array of sources such as the root systems of trees and soil organic matter. Disturbances such as deforestation and fire send both aboveground and belowground carbon back into the atmosphere–when lands are cleared, the newly exposed soil organic matter and root systems begin to decay, releasing the stored carbon. By protecting their forests and lands, communities are safeguarding vast reservoirs of carbon belowground that would otherwise enter the atmosphere if these forests were destroyed. Tree cover loss in tropical countries around the world has been rising over the past 20 years. In 2017, the tropics lost 15.8 million hectares (39 million acres) of tree cover, an area the size of Bangladesh, representing the second-worst year for forest loss on record. Nearly 75 percent of the carbon managed by Indigenous Peoples and local communities (217,991 million metric tons) is in the tropics and subtropics, according to the recently released report. Land rights can be a bulwark against deforestation. Legally-recognized indigenous and community forests are associated with lower rates of deforestation and store more carbon than forests in other management situations, such as government- or privately-managed forests. In the Peruvian Amazon, for example, legal recognition of indigenous and community forest rights reduced deforestation by up to 81 percent in the year following titling, demonstrating that titling can sometimes have immediate climate effects. But legal recognition hasn't been extended to at least one-third of the community-managed carbon in the tropical and subtropical countries assessed in this report. Globally, Indigenous Peoples and local communities only have legally-recognized rights to 10 percent of the world's land, despite having customary claim to much more. Even less indigenous and community land is formally registered and documented. Recognizing strong rights to community land is a cost-effective solution to reducing deforestation. The estimated costs of carbon mitigation by securing forest rights on indigenous lands in Bolivia, Brazil and Colombia is 5 to 42 times less expensive than other carbon mitigation strategies such as carbon capture and storage of fossil fuels. Forest management is a collective effort by thousands of individual Indigenous and local communities around the world. On the interactive map LandMark: The Global Platform of Indigenous and Community Lands, users can visualize the vast areas of forest that Indigenous Peoples and local communities manage as well as calculate the amount of forest carbon stored in specific community lands. The people of the Ikahalan community in the Philippines, for instance, have protected their ancestral forests for generations. 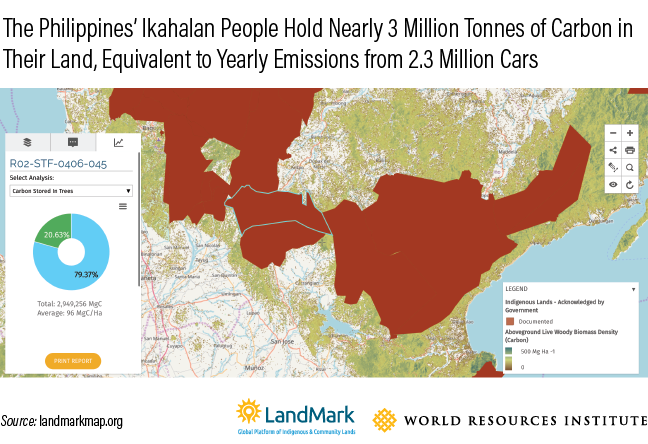 LandMark's carbon storage analysis tool estimates that the trees in the Ikahalan's domain (outlined in blue in the map below) hold nearly 3 million metric tons of carbon, with an average of 96 million metric tons carbon per hectare across their entire territory. The total carbon stored in their lands is equivalent to the yearly greenhouse gas emissions from 2.3 million passenger vehicles. As global forest cover declines, securing Indigenous Peoples' and local communities' rights to land and recognizing them as forest stewards is essential to mitigating the climate crisis. This will help countries achieve targets and ambitions set out in their Nationally Determined Contributions (NDCs) to climate action, Sustainable Development Goals (SDGs), and similar plans. Indigenous Peoples and local communities must be included in national and global climate action. Their land is vital in the struggle to mitigate climate change.